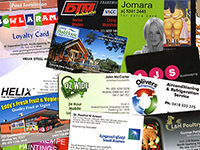 or call us on (03) 5278 3315.
Business Cards are printed on quality 350gsm stock. Gloss or matt laminating is included. Rounded corners are available on most products at no additional cost. Finished size is 86 x 54mm, the same size as a credit card. Our cards therefore fit nicely into your wallet (particularly if finished with rounded corners). Prices start from $99 for 500 single sided cards, and include GST, artwork, colour proof copy, printing, laminating and delivery anywhere in Australia. No hidden extras! Our Xerox colour digital printer is ideal for short runs such as annual reports, submissions, labels, club newsletters and family histories, even carbonless invoice pads. Our booklet maker takes all the pain out of collating and stapling! For larger jobs we are able to take your job right through to print. 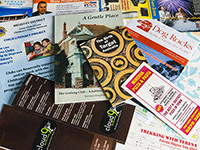 Having dealt with a range of large printing firms both in Victoria and interstate, we are in a position to secure competitive pricing for any printing job, including business cards, leaflets, and even full colour magazines. 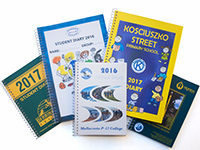 Diaries are spiral bound with tough plastic covers, and are available in A4 or A5 sizes. Inside front and rear card covers are printed in full colour; the internal pages are printed in B/W. Fully customisable school content pages can include information such as uniform policy, term dates, map of school grounds, lists of key personnel etc. There is NO minimum quantity, so we're able to print quantities to suit smaller schools. Contact us now for a customised quote or to receive a FREE no-obligation printed sample.